A SWOT analysis will enable you to identify strengths, weaknesses, opportunities and threats at the organisational level. Process mapping will enable you to understand weaknesses and potential areas for improvement with regards to particular organisational practices. To carry out these activities you will need to bring together relevant people from within your organisation. 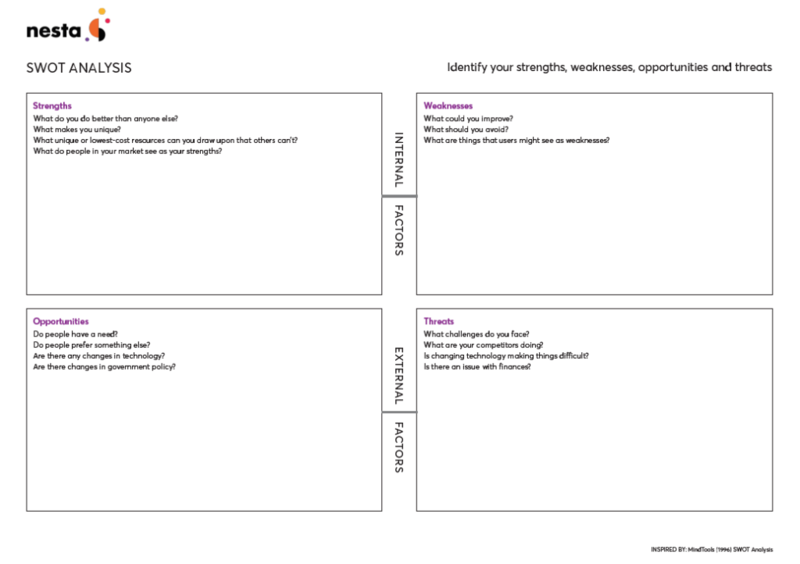 SWOT Analysis (strengths, weaknesses, opportunities and threats) is a tried and tested tool for analysing a project, organisation or even an entire sector. It can be used to generate useful insights at different levels (HQ or in-country) and with different challenges, ideas or timeframes in mind, and it is therefore a good framework for evaluating strategies or feeding into reflections on the initial impressions of a problem. At in-country level strengths and weaknesses can change quickly over time and so a SWOT analysis could yield very different insights from an organisational perspective depending on where you are in the disaster management cycle. For example, you may have significant funding (strength) in the response phase but insufficient numbers of skilled staff (weakness), whereas in the reconstruction phase you may see cuts in funding (threat) but increased political support for disaster risk reduction programming (opportunity). Read the instructions provided on the DIY Toolkit website, download and print out the template as large as possible (or draw it onto a flipchart) and use sticky notes to map out the internal and external factors that are helping or hindering you in achieving your goals. When thinking about innovation most people imagine disruptive ideas aiming to radically change humanitarian action. In reality, such innovations are extremely rare; the best way to make significant gains might be by making a series of small improvements (Harrell, 2015). One of the most powerful tools to achieving this type of change is process mapping. Process mapping enables you to identify areas of weakness in your organisation’s operations, and to develop solutions that can create these incremental (and sometimes large) gains. 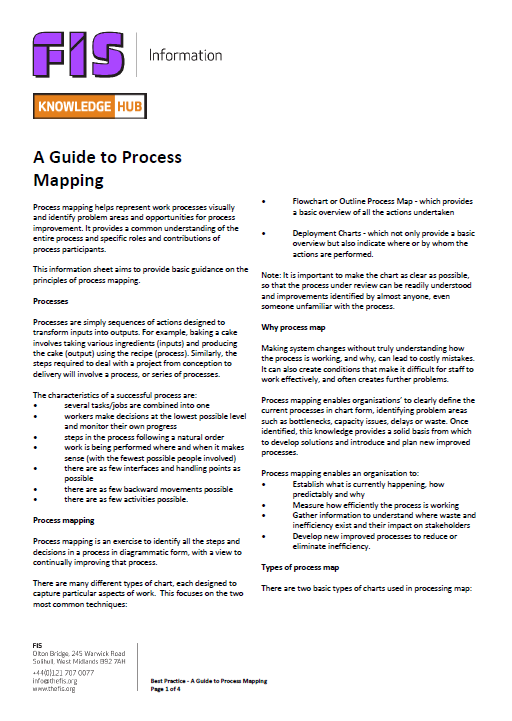 Download the FIS Best Practice Guide for Process Mapping below, familiarise yourself with the contents and plan the exercise. Bring together a group of people working in and around a particular process, such as those who carry out the process, those who supervise the process, and those who are affected by it, and work through the exercise as a team. Ensure that you involve representatives for all process participants, giving particular consideration to community members or other external actors who might be involved. If you are working with both staff members and affected communities, be aware of the power dynamics and how they might influence opinions that are voiced.